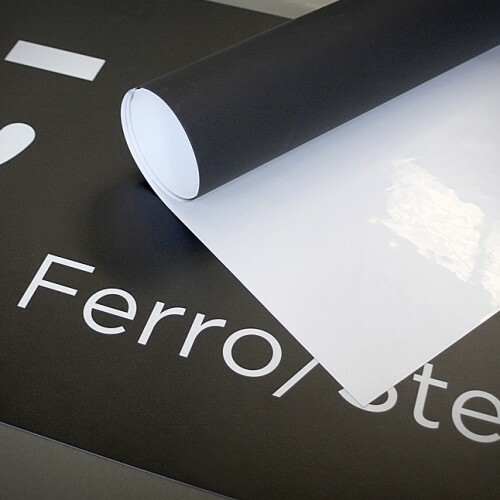 PP HD Ferro material (magnetic receptive material) is white PP one side for great graphics for short term displays 3 - 6 months and a black ferro coating the other side. If the display is for longer than 6 months you should consider the PET 0.18mm. Super light great for instore graphics - marry it up with adhesive backed magnet (https://www.bisbellmagnets.com/adhesive-backed-magnetic-sheet) to create stunning in-store displays. Suitable for solvent/UV and Latex inks. Larger discounts for multi-roll purchases, please contact us direct for best price.